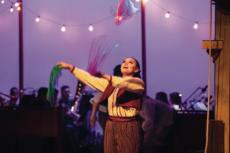 Lauren Shelburne | Banner Nicole Marks, junior theater major, plays her part as a circus performer by juggling flags for the smiling audience. lijah Hickman | Banner | Julia Olsen-Rodriguez, Riverside County resident, has a passion for dancing and loves to share that passion with her community. 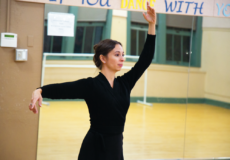 She teaches both children and adult ballet classes at the Orange Terrace Community Center in Downtown Riverside a few times a week. 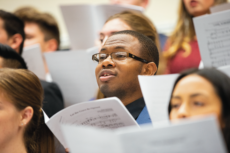 Kelsie Stevens | Banner | Stephen Wright, senior music education major, sings baritone in the University Choir and Orchestra.